New Year fever is gaining momentum with queues bringing us back to Black Friday shopping madness. But there are things you can’t buy, even with you MasterCard. This kind of present you get from Gurtam team on New Year’s Eve. So get ready for Wialon Hosting 1216 Update. This time again the system is supplemented with brand new features and those recently made available in Beta-version. And if you were the first to try them, now can you can be the pioneer to put the new functions into practice. 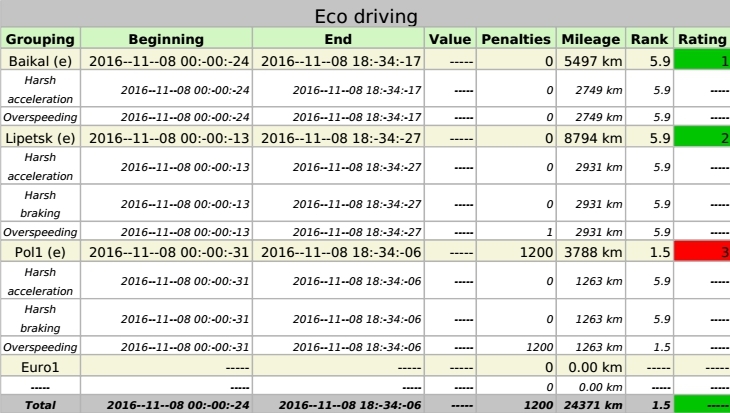 Eco Driving helps to distinguish between reckless and diligent drivers by ranking them on the basis of penalty points. Subsequently, our clients can encourage top-class drivers and strictly control those posing danger on road. In case when drivers work in a group, one person can explode the reputation of the whole team. To easily find “the wolf in sheep's clothing” we added “Rating by violations” to Eco Driving report for driver and unit groups. Moreover, we added color marking making driver ranking within the group more intuitive. If the driver is marked red, assume supervision over his operations. Green marking is another reason to reward him. Please see Wialon docs to find out more about the feature. Whatever you do it’s better to check if you did everything right. Test page while printing, first love… Now you a have chance to run test execution of a job in Wialon. The one-time job execution doesn’t affect its schedule and helps you check the expected result (for instance, if a proper report was created and sent to your e-mail). Thus, when the result is critical, you may be sure that nothing will go wrong. Just recently connection loss was considered to be a total absence of messages from a unit for a specified time period. 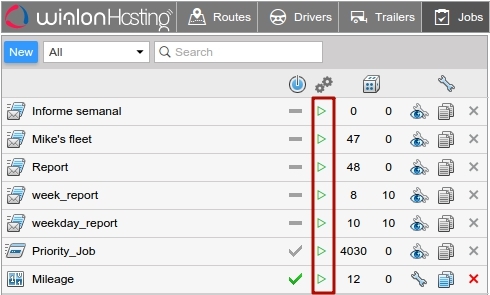 Wialon Hosting 1216 contains a new option to detect connection loss based on GPS data. The above allows to detect time intervals with no satellite connection, while the former option detects when the device was disconnected or broken down. To activate the new option please mark the corresponding flag in advanced settings of report templates. 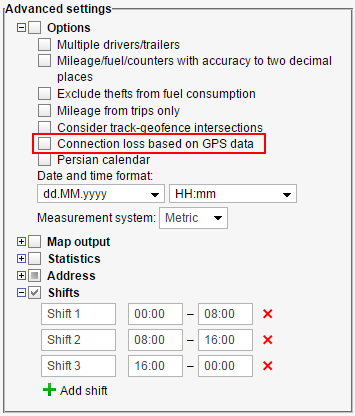 “Connection loss based on GPS-data” is relevant for “Connection Problems” and “Chronology” tables and charts when selecting connection loss background. That way tables and charts contain time intervals lacking data on unit location, otherwise you get the periods with no unit messages at all. To make data display in sensor counter table more convenient we added “Value” section to table filters. This helps to eliminate irrelevant values appeared due to hardware peculiarities. Signal pick-off device, for instance, detects even minor alterations in fuelling unit hose. The values made it into counter report as zero fuel filling and led to the report being imperceptive. From now on this can be avoided by setting value limits for counter sensors in the corresponding table. 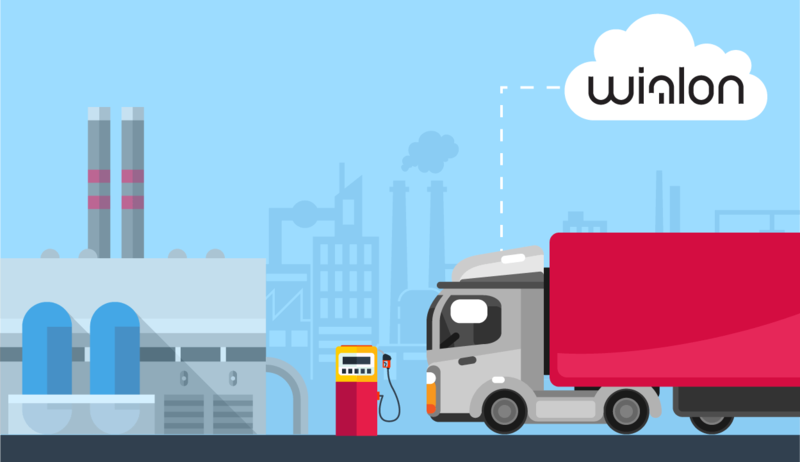 Order report is now available not only for single units and drivers, but also for unit/driver groups. We extended engine hours statistics with new fields: consumed in motion, avg consumption in motion, avg consumption in idle run. Long-awaited novelty for the adherents of mapping services by Google. 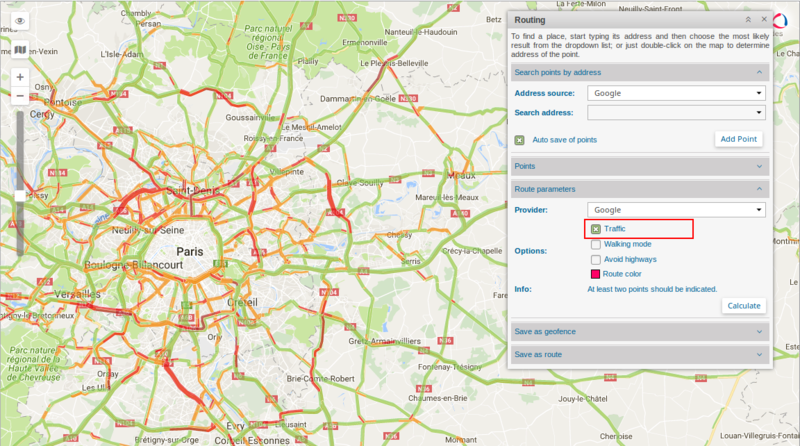 Your Google Maps key literally becomes a master key, as we supplemented Routes tool with an option to generate routes allowing for traffic jams. Using this you’ll definitely get to your destination faster, wherever it is. CMS Manager conversion and retranslator dialogs not only acquired refined design, but also search by units. Handling any system elements at conversion has now become faster and simpler. We fixed “Add line” button in calculation table of sensor properties. With the button always in the lower part of the dialog the users no more have to “follow” it while adding multiple lines at once. Novelties also include updated maps configuration. Apart from a renewed design in user settings, making it simpler to manage maps, we added one more option for the enthusiasts of Gurtam Maps service. It’s now possible to disable all the maps, except Gurtam Maps, including Open Street Maps. As far as there’s only one cartographic provider left on the list, nothing will distract you from the best mapping service by Gurtam. The novelties will become available by the end of the day and we consider Wialon Hosting 1216 to be a pleasant complement to Christmas presents, that will accompany you throughout 2017. Please leave your comments and suggestions on our forum. We wish you happy holidays and another fruitful year in Wialon Community.